Apple Business Chat adoption continues to grow at a slow but steady rate, with Cleveland's Quicken Loans Arena and stadium food vendor Aramark the latest to adopt the technology in a system that allows iPhone-toting customers to order drinks from the comfort of their seats. Quicken Loans Arena partners with Aramark on Apple Business Chat initiative. The pilot program, currently available at Cleveland Cavaliers NBA games and Monsters AHL match-ups, leverages Apple's customer chat technology to enable in-seat menu browsing and ordering through iOS Messages, reports. As reported by TechCrunch, customers access Aramark's menu system by opening iPhone's Camera app and scanning a QR code label affixed to the back of their seat. The scan takes users to a custom Business Chat screen that is auto-populated with a message reading, "Hit send to start your order." 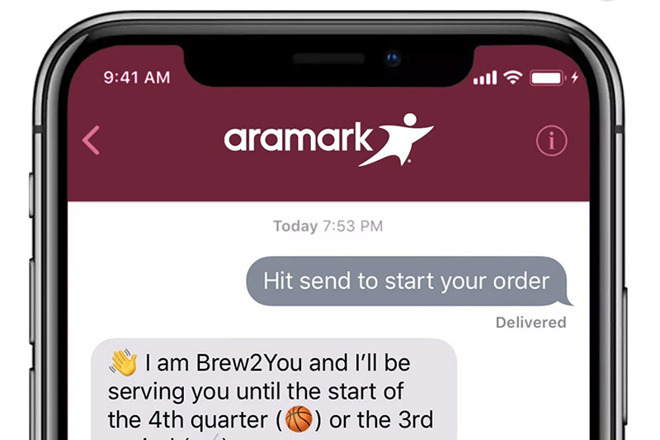 Sending the pre-generated message activates the Brew2You bot, which notes arena-specific beverage serving times and presents a link to Aramark's menu. After selecting a drink of their choice, customers enter their seat number and pay for the order with Apple Pay. The drink is subsequently delivered directly to a user without further interaction. Aramark did not specify typical processing and delivery times, the report said. "The integration of Apple Business Chat with the ordering process is not only fan-friendly and easily accessible, it's reflective of fans' changing expectations and behaviors and we're looking forward to Cavs and Monsters (Cleveland's AHL affiliate) fans giving it a try," said Kevin Kearney, district manager for Aramark's Sports and Entertainment division. Aramark plans to trial the system for the remainder of the season. Apple Business Chat launched last March with the release of iOS 11.3, allowing companies to connect with customers through Messages chat sessions. Current support is somewhat limited with notable integrations from Apple, American Express, Gubagoo, Home Depot, Newegg,TD Ameritrade, T-Mobile and Wells Fargo. Most recently, Sprint in January enabled Business Chat customer service capabilities for iPhone and iPad owners.